It’s late at night, you worked a double shift, and it was an overall stressful day -- and you still have to get home in time to feed your family and run some errands. As you’re walking out to your normal streetside parking spot, you get a funny feeling. Something is off. As you get closer to your car -- or rather, where your car should be -- your heart starts to race. It’s nowhere to be seen! You frantically look every which way before calling 911. By the time the police arrive at the scene, you are trying to remember as many details as you can about your vehicle, and hoping for its safe return. What would you do if your vehicle was stolen? Do you know how the stolen car insurance claim process works? Through the bewilderment and adrenaline rush, you need to remain calm and think clearly. Your first response should be to verify no other possible explanation exists to explain your missing car. Did you park illegally, making you susceptible to having your vehicle towed? Are you in jeopardy of having your vehicle repossessed? It can be very embarrassing to file a stolen car insurance claim and police report just to realize it wasn’t stolen after all. Once you have worked through alternate reasons for your vehicle to be missing and determine your vehicle was stolen, it is time to start the car insurance claim process. Is Theft Covered by Your Car Insurance Policy? In every state in the U.S., you must hold comprehensive coverage on your insurance policy to have coverage for a stolen vehicle. Even if your car was stolen from your residence, only an auto policy with comprehensive coverage will cover your loss, not your home insurance policy. It is a common misconception a home policy will cover a vehicle, and it is not true. Auto policies cover autos and home policies cover homes. A stolen car needs to be documented as soon as possible by the police. You should also notify your insurance company immediately of the situation by contacting your insurance agent or calling your insurance carrier’s customer service number. Your insurance agent can help you verify whether you have comprehensive coverage listed on your policy and help you file the claim. Many insurance companies require a minimum waiting period for a stolen car claim to be finalized. Often the wait time it thirty days in order to see if the vehicle can be recovered. The time period typically starts at the time the vehicle was stolen and not when you filed the claim. Ask your insurance carrier what time frame is required for your claim to be finalized. That is right: if your car is stolen, you have a total loss claim on your hands. You will need to come to an agreement with the insurance adjuster as to the current value of your vehicle minus your deductible. After an agreement is made, you will need to have your lender, if you have a loan, sign off on the title. Finally, you need to sign the title over to the insurance company. You will no longer have any ownership of the vehicle. If the vehicle is found after the claim has been settled, the insurance company will have ownership. It is possible to work out an agreement with the insurance company if the vehicle is found and you want to buy it back. What about Damages to the Vehicle if it is Recovered? Comprehensive coverage will also cover the damages to your vehicle if it is recovered. The thief may have destroyed your interior or wrecked the vehicle. The repairs will be covered with comprehensive coverage minus your deductible. 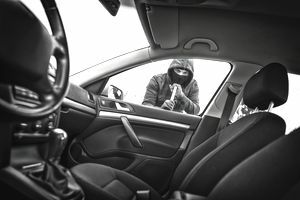 Is There Coverage for Your Belongings in the Stolen Car? Your vehicle may have been stolen along with a lot of your possessions. GPS, car seat, Christmas presents, or CDs, the list is endless of what might have been lost with your vehicle. Personal belongings in a vehicle are not covered under your auto policy. You would need to have purchased a homeowner’s or renter’s insurance policy (unless you’re a resident of New York City -- then your property isn’t covered anywhere in the five boroughs that’s not inside of your home). The big problem with coverage on a separate policy is being forced to pay a separate deductible. If you have your auto and home insurance with the same insurance carrier, check with them to see if you can consolidate into a single deductible for the loss. Separate insurance carriers certainly will not bend on your deductible. It is another good reason to have all of your insurance with a single insurance company. The probability of having your car stolen is based highly on where you live. Most insurance companies offer a discount for having a car alarm. The savings you receive is based on how much you are paying for comprehensive coverage. Often the savings seem slim because the anti-theft device discount only applies to the comprehensive coverage and not your entire policy. If you are unsure of what your policy covers, make sure to learn about car insurance by reviewing with your agent or reading up on the subject. Knowing how your policy works before a claim situation arises will relieve you of a lot of stress. Remember to go over your car insurance policy thoroughly every renewal to ensure you have the coverage you want.